 Public Lab: Raising the Dead: Grassroots Mappers Help Look For America’s First Veterans Cemetery. 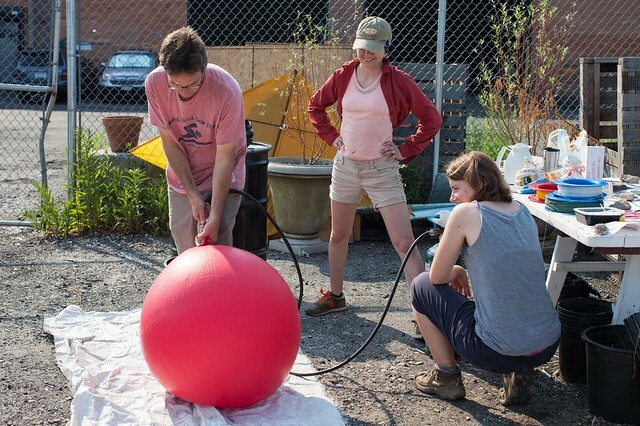 The ballooners were hoping to find “grassroots” clues to history hidden underneath our feet. 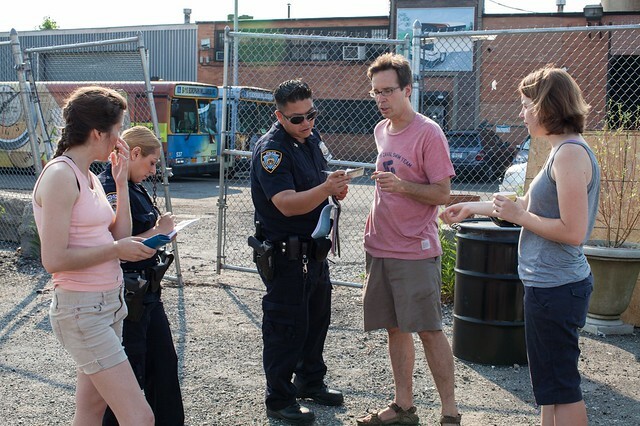 Working with historical research from Brooklyn preservation groups including the Brooklyn Preservation Council and Proteus Gowanus, the Grassroots Mappers zoomed in on an abandoned vacant lot at 170 8th Street, next to 3rd Ave, in the Gowanus neighborhood of Brooklyn. The key reasons for interest in the site was that this particular lot had been identified as the sole remaining remnant of “Marylander Hill”, described by historians as a grave site for early colonial settlers, slaves and War of Independence soldiers. 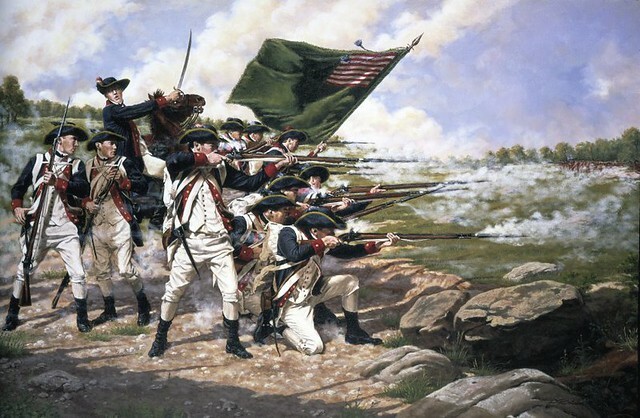 By comparing topographic surveys from the 1850’s with current data, it was established that the site was at the same 24 foot high elevation that it was on 27 August 1776, day of the Battle of Brooklyn. Even though the historic cemetery was eventually covered by industrial buildings in the 1880’s, the study sites buildings had burnt down, exposing the concrete floor slab to decades of weathering over original soils that had never been excavated. "On the shore of Gowanus Bay sleep the remains of this noble band. Out upon the broad surface of the level marsh rose a little island with trees and undergrowth. Around this mound, scarcely an acre in extent, clustered a few of the survivors of the fatal field and of the remorseless swamp, and here the heroic dead were brought, and laid beneath its sod, after the storm of battle had swept by. Tradition says that all the dead of the Maryland and Delaware battalions, who fell on and near the meadow, were buried in this Miniature island, which promised at that day the seclusion and sacred (quiet which befit the resting place of the heroic dead. Third avenue intersects the westerly end of the mound; and Seventh and Eighth streets indicate two of its sides". In 1956, the U.S. National Parks Service did a historical site survey, entitled Historical Orientation Report for Archaeological Investigation, Marylanders’ Burial Site, Brooklyn, New York. Dr. Nicholas Ryan, a Brooklyn Heights physician, is quoted there stating that in the 1890s his father, a building contractor, had found "the bones of some thirty bodies in regular, or military order," in the course of digging cellars for apartment buildings in the Marylander Hill area. 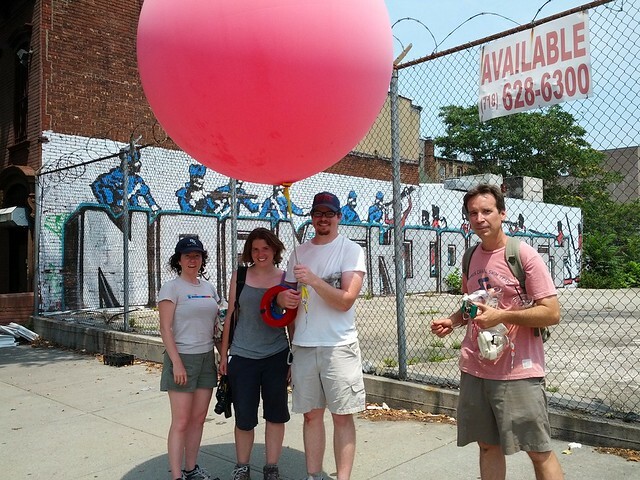 Based on the above historical maps and recorded evidence, and the promise of an excellent pie shop nearby, the “Over My Dead Body” Mapping Team launched their 56” diameter red weather balloon from the nearby Gowanus Canal Conservancy’s high tech Mission Control Center, home of GLAM (Gowanus Low Altitude Mapping) at 2nd Avenue and the Gowanus Canal. The balloon was filled with helium gas kindly provided by Liberty Industrial Gases, a local business, and a SD880 Canon 10 megapixel camera (slightly used, with Snoopy and Hello Kitty stickers) and lodged into a state of the art crash landing protector made from a 100% organic carrot juice bottle and little girl’s hair bands. The Red Balloon was tethered by two strings, allowing for virtuoso navigation in the narrow barbed wired lined industrial Gowanus streets. 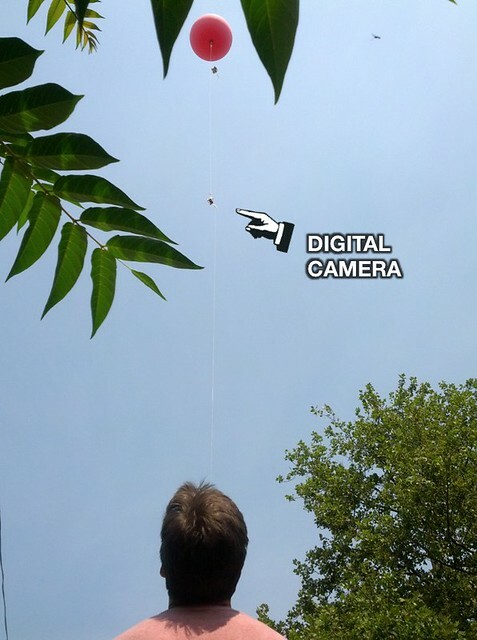 Using a CHDK script that programmed the camera to take pictures every 10 seconds the balloon was sent up over the site to a height of about 500 feet. Looking at the photographs a couple of minutes later, over coffee and most excellent pie, a curious fact was uncovered by scrutinizing the high resolution images: the cracks in the concrete – the “grassroots” – were telling a story. 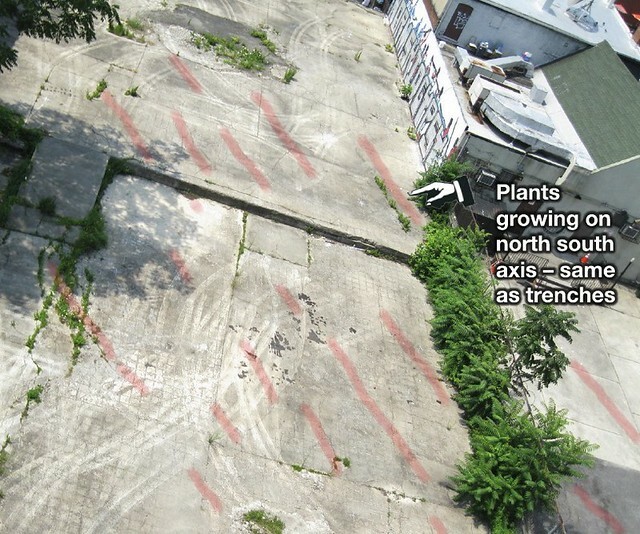 The concrete slab that covered the lot had a visible concrete reinforcing mesh, oriented to the same angle as the street layout, being on a north east to south west axis. Nothing unusual there. However, by looking at the photos carefully, a pattern of unusual cracks could be seen running across the site on a NORTH – SOUTH axis. Blank stares at this announcement. Christian military burials were often laid out on this axis, so that the dead bodies could face the rising sun, symbol of resurrection. Why did the cracks follow the same alignment – was it just coincidence ? A strange pattern of cracks and slight discolorations in the concrete hint at minute depressions in the concrete slab - further LIDAR and ground penetrating radar studies would confirm or deny wether remnants of the trenches remain. What was even more unusual was that the spacing between the trenches was about 8 feet. This matched the general description, location and space needed to accommodate the up to 256 soldiers supposedly buried in 6 burial trenches described by Henry Wildhack Jr., a local resident quoted in the 1956 Parks Service Archeological Report. He stated there, that in 1905 as a child, he and his friends used to dig on the exposed 6 burial trenches and "it was nothing new for us to find bones and various shapes and pieces of metal." Though the patterns could be entirely coincidental, they add weight to the historical evidence indicating the possibility that a small portion of the Marylander Cemetery may have survived the ravages of urbanization. It is entirely possible that remains are long gone, and that the site now only has commemorative value. The 170 8th Street vacant site (Block 01003 Lot 0011) is currently owned by the Fried family and is available for redevelopment. 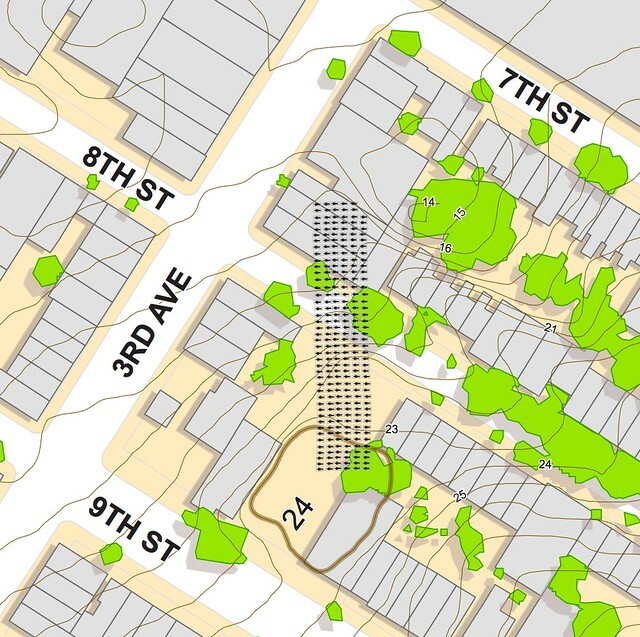 Because of recent population growth along 4th Avenue and encroaching high rise apartment buildings, the site is in imminent danger of being built over again. At the same time, the new population increases require that the City provide new open space facilities for new neighborhood residents. This is a role a commemorative park could play. 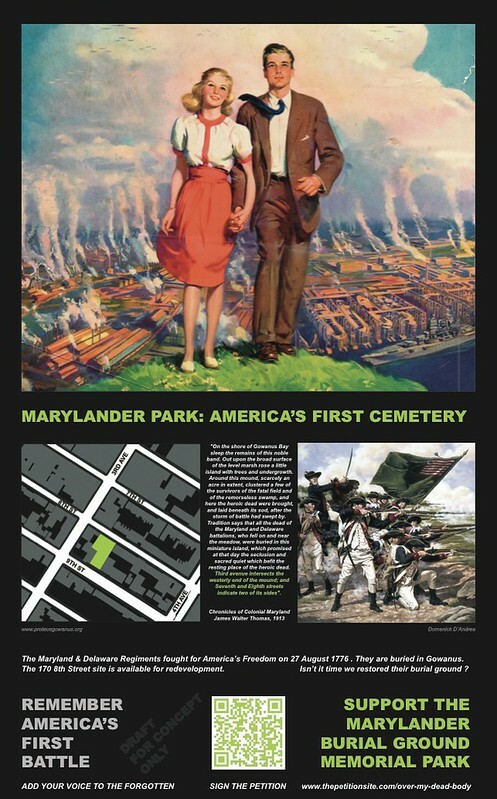 In September 2012, the Governor of Maryland, Martin O’Malley, alerted to the new Marylander research by Justin’s NY Times article, wrote to New York City’s Mayor Bloomberg pledging Maryland’s help in preserving this important site of American history. Thanks to community based Grassroots Mapping effort a site destined for oblivion is being given a second look. Local preservation groups will now be approached to discuss the best way to honor the first soldiers to die for American Independence. A coalition of groups may form around this common cause, including the Gowanus Canal Conservancy, (spearheading sustainable watershed based open space planning) the Brooklyn Preservation Council and Proteus Gowanus, (dedicated to deepening the community's sense of connection) Friends and Residents of Greater Gowanus (also doing historical preservation work) and the Old Stone House, who has led commemoration of Battle of Brooklyn events. In terms of what physical form a new park might take, one vision is to recreate a historical network of greenways and rain water management blueways tying all the different Gowanus watershed sites together, from the Old Stone House, to the Marylander Burial Site and through this landscaped greenway create walkable links to the Gowanus Canal historic tidal mill battle sites, currently a Superfund site. This would help rebuild a better environment so many have fought for. Pensive on her dead gazing I heard the Mother of All, Desperate on the torn bodies, on the forms covering the battlefields gazing, (As the last gun ceased, but the scent of the powder-smoke linger'd,) As she call'd to her earth with mournful voice while she stalk'd, Absorb them well O my earth, she cried, I charge you lose not my sons, lose not an atom, And you streams absorb them well, taking their dear blood, … In unseen essence and odor of surface and grass, centuries hence, In blowing airs from the fields back again give me my darlings, give my immortal heroes. A 2012 laser topography survey of the site shows an unusual pattern of bumps on the site. They may just be remnants of the concrete pouring process, but coincidentally, they are exactly the same shape as human bodies. It's a draft contour map exploring the use of LIDAR (Light Detection and Ranging) to create high resolution terrain models. It seems to show mounds that look like graves, but their alignment contradicts the "north-south" burial axis mentioned in the "Over My Dead Body" post. Maybe bodies were aligned to magnetic north, or just followed historical contours.. The DIY technological challenge is how to replicate the enormous potential of this 3D visualization technology cheaply, using Xbox Kinect or Iphone4 3d mapping technology suspended from balloons. The only way to win the game is to lose. Hopefully, in honor of Veteran's Day, this is one battle we can win for those who lost their lives to make America's history possible.